Just a quickie tonight. I should be in bed catching up on lost sleep. 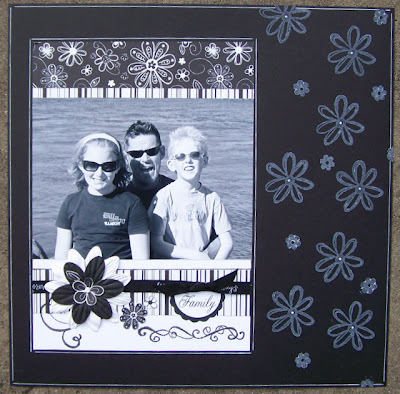 But this thing called SCRAPBOOKING is keeping me awake...lol...i am sure there are others that understand! I picked up some Patterned papers at SCRAPSIDAISY today & really couldn't decide which one I liked the best. So I used a piece of all of them on the one page. I also used a photo of myself......mmmmmmmm...what was I thinking?????? Off to bed now to grab a bit of sleep while I can. Brock's spots are "ITCHY" now & he keeps waking up. Needless to say I should have been in bed hours ago!!!! I have turned into a very slack blogger I know! Too much going on & not enough time to fit it all in! I have been creating away & have heaps to share. Firstly (on the home front!) yesterday my D.S, Brock, came down with "chicken spots". He is pretty well covered with spots but hasn't been extremely unwell! (touchwood!!) & I sure hope it stays that way. I did take some pic's this arvo but I won't embarrass the poor little might by posting them on here! I would like to also invite anyone, that is interested, to join the challenge that I have just started on the Scrapsidaisy Forum. Who knows if we have enough people participate we might start to offer prizes! Next up- several weeks ago I created a Kaiser clock . I used a Kaiser paper range as well. I plan to display it on my T.V cabinet in my lounge room. I am a really happy with how this turned out too. I am actually helping a few ladies create one similar tomorrow!!! The other thing that I created (that I CAN share) is a page -again using a Kaiser paper range. 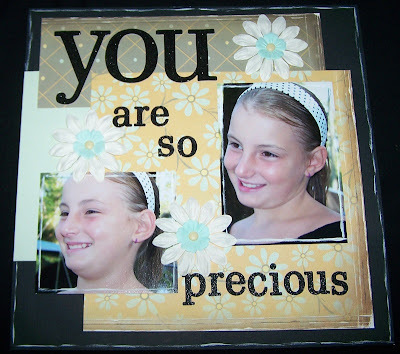 have you checked out the SCRAPSIDAISY forum? It is so much fun & really, really addictive! We are currently looking for friends to take part in our Easter ATC swap! As well as that we are also hosting a ribbon swap! It is always lovely to receive SNAIL MAIL so if you are keen make sure you check it out & come on over & join in the FUN!!!!!!!!!!! 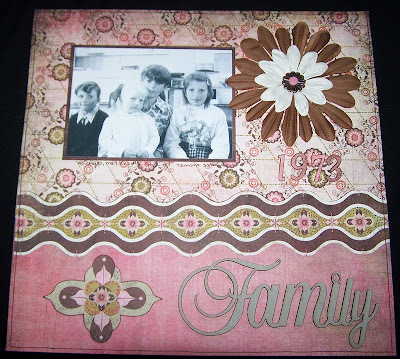 I have just finished a page using the lovely, lovely new SCRAPWORKS- Love In Bloom p.p's & I just have to share it with you all! the papers & embellishments are just BEAUTIFUL! I also used, for the first time, the ever so yummy Basic Grey (Two Scoops-Heart Smudge) acrylic stamps that I picked up today at SCRAPSIDAISY! The photo is of my D.D earlier in the week. 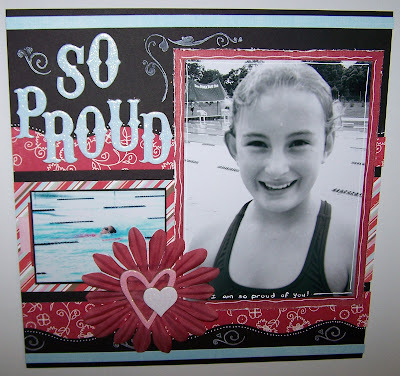 It was the first time she had competed at a swimming carnival & she was so determined! She didn't win BUT she was a winner to me as she was so afraid that she wouldn't make the distance (she had never swam that distance ever before) & she did it without a drama!!! NOT bad considering she couldn't swim 4 months ago! & as promised today is the day to draw my RAK. from "Janes creative Process" who is also a SBS4 sister. Congratulations Jane. I have been really busy creating over the last few weeks. The weather is still really wet & overcast here so no photos have been taken as yet. Call me a slack blogger if you wish! I will try to get some shots today! 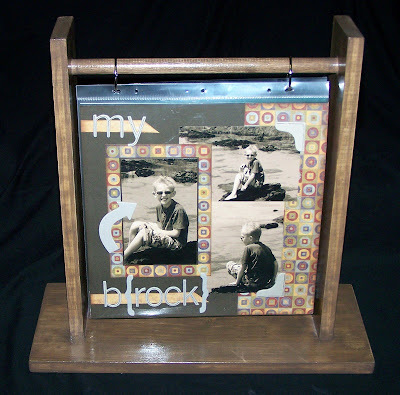 The first in the series is a vertical scrapbook custom made locally from quality solid pine timber. The timber can be left raw, painted and/or varnished as you would any other pine product to match your living area. They are perfect to show off your favourite layouts in your loungeroom, on your mantle or coffee table, even on the kitchen bench. As your layouts are covered in plastic they are perfectly safe from spills, stains and little finger smudges yet can still be enjoyed in your living area - not tucked away in an album. They also make an ideal gift. Just add some of your layouts and the recipient can enjoy your work in their home year round. When you do a new layout for them they can easily add it so the "look" can be freshened up as little or as often as you like! 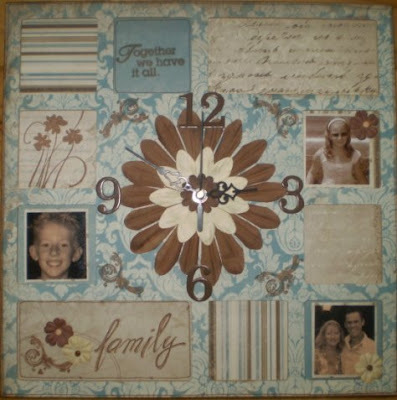 Why not add a little calendar on a layout for each month and use it as a very attractive piece of home decor to be enjoyed all year round or, why not take a photo once a month of your children, scrap it and add it to your album each month. It will be fun for the whole family and visitors to see how much the children have grown and changed from January to December. There are so many ways this product can be adapted to "live" with you in your home. I just know that they will be popular! The response today was unbelievable! One lady wants 6! thats right 6! She knows a good thing when she sees it! Thanks for visiting & make sure you leave a comment to let me know what you think! Wet, Wet, Wet!!!! !& some Exciting news! I am starting to get OVER the rain....LOL...It has been the wettest summer that I remember. The weekend was wet & miserable! So I spent a few hours playing in my scraproom! It was the perfect excuse! I created a few pages that I will share. The photo's I have used on other projects but hadn't actually done any pages using them.